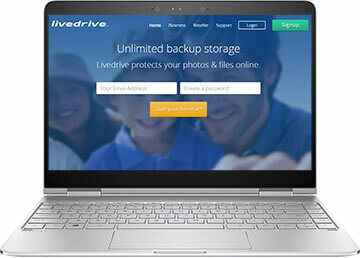 Get a discount price or a free trial of LiveDrive backup service with the coupon codes and special promotional offers listed here. If you want to compare LiveDrive vs DropBox or LiveDrive vs Carbonite backup services, get the free trial to find out which is best. Most geeks have probably heard the expression, “On the keyboard of life, always keep one finger on the escape button.” The saying is funny because we know our lives are on our computers. That’s why we need instant, automatic protection of our computer files, from music and photos to financial and personal documents. Livedrive enables you to backup all of your computers, whether they be Macs or PCs. Chose from Backup, Briefcase, or Pro Suite plans to secure just the right online storage and online backup solution you need. Livedrive offers a free trial on all of its products, with no commitment, so you can test drive their services before you ever pay a dime. With Livedrive, you can quickly, securely, and automatically backup every file on every computer online and then see those files on the web from your desktop, iPad, iPhone, or Android. They also offer a package that allows you to sync files across all computers, share files easily across the Internet, and work on the same files on both your Mac and PC. When you log on to www.livedrive.com, you’ll learn how to get the type of cloud storage that best suits you. Instead of storing your files on a hard drive in your computer, you can store them on your “livedrive,” an unlimited, secure storage space that can be remotely accessed from any Internet-connected computer or device. Techies will appreciate Livedrive’s advanced features such as FTP and Webdav. If you’re a web designer, system integrator, or entrepreneur, you may also be interested in Livedrive’s popular reseller package. This fast-growing, highly rated, flexible online storage company offers a full range of services from online back-up to file synchronization.